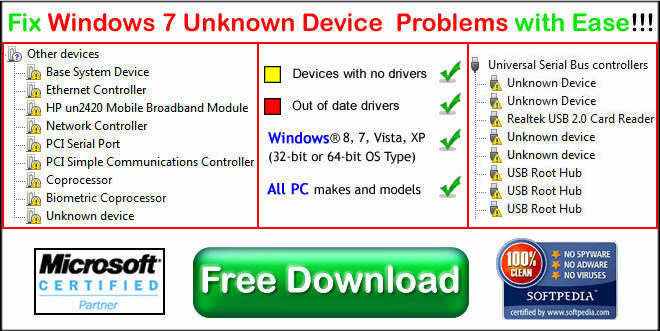 Windows 7 Unknown Device – How to Fix It? 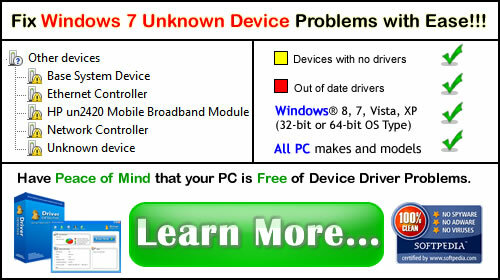 Fixing Windows 7 Unknown Device problems can end up being a very frustrating task for non-savvy PC users. There is a lot to be considered when it comes to unknown devices. This article will focus on the most common cause, at the root of which are missing, outdated, corrupted, or incompatible device drivers! When it comes to PC hardware device functionality, it is critical to make sure that the Operating System (OS) and its device drivers are fully functional and compatible. An instant solution to solve Windows 7 Problems with Unknown Device saves PC users time, energy, and money when compared to hiring a technician. This solution requires an Automatic Driver Update/Repair Software, and one of the leading software available online is Driver Detective. Driver Detective automates your scanning process and facilitates device driver updates and installation. Before you may realize several of its benefits and advantages, let us first discuss the most practiced manual solution for attending to Unknown Device in Windows 7. There are several things to be considered before searching for device drivers online to solve Windows 7 Unknown Device problems. First, you need the Vendor ID and Device ID of your hardware device. You will be able to find Vendor and Device IDs by following these steps: right click on the unknown device (assuming that you are already in the Device Manager), click on “Properties,” and then click on the Details tab. Then on the drop-down list, choose “Device Instance Path” to display the alphanumeric data. Now we need to identify the Device ID and Vendor ID which will be used in the online search for your device driver. From the given example above, VEN stands for Vendor ID with a value of 10DE and DEV stands for Device ID with a value of 03D1. After obtaining these IDs, you are ready to search online or visit the manufacturers’ website and search for your device driver to solve Windows®7 Unknown Device. Always remember that before downloading your device driver you must be aware of your PC’s “system type” which provides you with the useful piece of information you need before you start searching for compatible device drivers. Compatible device driver pertains to drivers capable of initiating the communication between your computer and the hardware devices. 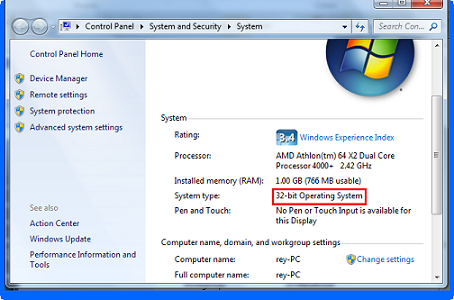 So it is very crucial to know if your Windows 7 OS type is 32-bit or 64-bit, because device drivers designed for 32-bit Windows 7 will not work for computers running 64-bit Windows 7. To find out if you have a 32-bit or 64-bit OS, click on Start or the Windows button > right click on Computer > click on Properties. Here, you will be provided with your system information, including the system type. Once again, by knowing your system type, you will know whether you need to download 32-bit or 64-bit device drivers. This will reduce a risk of downloading incompatible device drivers which can affect your Windows 7 PC performance and cause unknown device problems. An incompatible device driver is only one of the dangers of searching and downloading device drivers manually. There are other dangers you might encounter by employing a manual method for solving Windows 7 Unknown Device such as downloading drivers bundled with viruses/malware, outdated or corrupted drivers. You will not suffer from frustrations caused by obtaining IDs, searching, and downloading online because Driver Detective automates the process for you. Driver Detective ensures that the device drivers to be downloaded or installed are compatible with your current operating system. There will be no need to worry about device driver incompatibility and whether your have a 32-bit or 64-bit OS. There are many more benefits that Driver Detective offers aside from solving Windows 7 Unknown Device problems and issues. You can experience the Driver Detective first hand by running a Free Driver Scan Now!